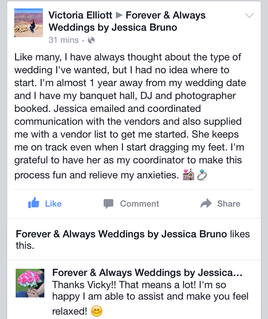 "Jessica did a great job with our day of wedding preparation. She was able to take what we envisioned for our centerpieces, sweet table and guest book table; and bring them to life. She was a huge help because it took a lot of stress off our families since we didn't have to worry about getting our hall set up the day of the wedding." "Like many, I have always thought about the type of wedding I've wanted, but I had no idea where to start. I'm almost 1 year away from my wedding date and I have my banquet hall, DJ and photographer booked. Jessica emailed and coordinated communication with the vendors and also supplied me with a vendor list to get me started. She keeps me on track even when I start dragging my feet. I'm grateful to have her as my coordinator to make this process fun and relieve my anxieties." Victoria & Rob on their upcoming wedding. "Ok so we definitely heave the best wedding planner ever. She sent us flowers to celebrate 1 year before our wedding. I can't say how much she does for us. I literally tell her what days I'm free or days Larry and I are both free and she calls the peeps, schedules things and we just gotta show up and make a decision. Honestly, I couldn't be happier. One of the best decisions we have made for sure. Thank you so much Jessica for everything you have done for us so far. We really couldn't be happier with everything you have done." Jen and Larry on their upcoming wedding. "You have helped us a lot with the wedding & planning. I couldn't have done any of this without you. Can't wait till the big day. Thanks for being great. Love Larry & Jen"